Himalaya is comprised of X number of cars (depending on the model) attached to sweeps that radiate from the center. Each car is outfitted with a wheel underneath the carriage that rolls along a track. Several of these wheels are connected to drive motors, which act in unison to make the ride revolve. Riders are restrained with a simple lapbar. Many Himalayas today also use seatbelts as a secondary restraint. 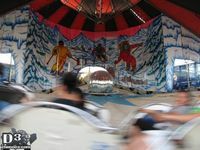 A ride on a Himalaya isn’t very elaborate as far as movement; the cars travel in a circle and navigate a set of hills in the process. A ride on Himalaya is really more about the atmosphere. 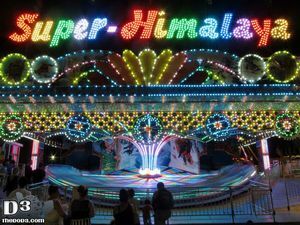 Himalaya’s are commonly referred to as “music rides” due to the ride playing music and having a general dance club aura to them in order to draw in riders. 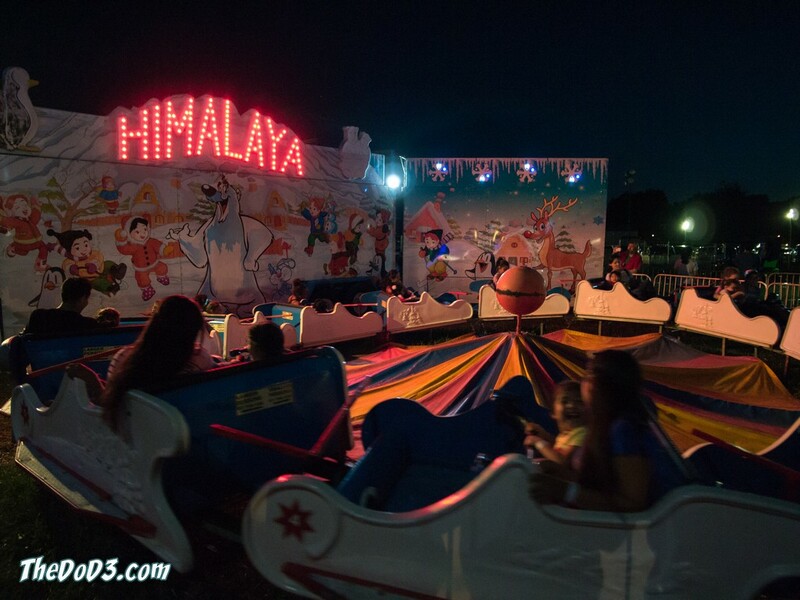 Along with music, many Himalaya rides will also feature lighting effects such as flashing LED or turbo lights, strobe lights, disco lights, and in some cases laser lights. Fog machines are also a popular feature as are bubble machines. 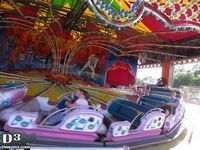 In addition, a horn or siren is usually standard fare for these rides and is sounded when the ride reaches its highest speed. Himalaya is one of those rides that can be customized as far as artwork, lighting, and overall appearance making some models extremely unique looking. Most have a roof structure, while some have been modified to be open air, such as Oscar’s Amusement’s Reverchon model. While surfing around, I found a neat little site called May’s Himalaya Fan Website; it’s a great place to find information and check out detailed photos of the older Reverchon Himalayas. Here’s a collection of photos of each Himalaya ride model. I’ll add more as I get/find them! 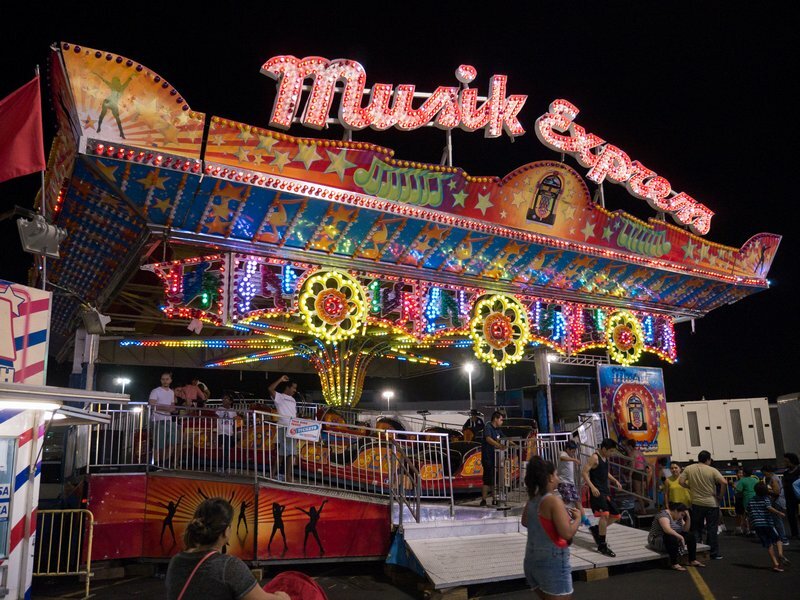 Here’s a Bertazzon manufactured Musik Express formerly at Casino Pier in Seaside Heights, NJ. It was destroyed during Hurricane Sandy, but they replaced it the next season. 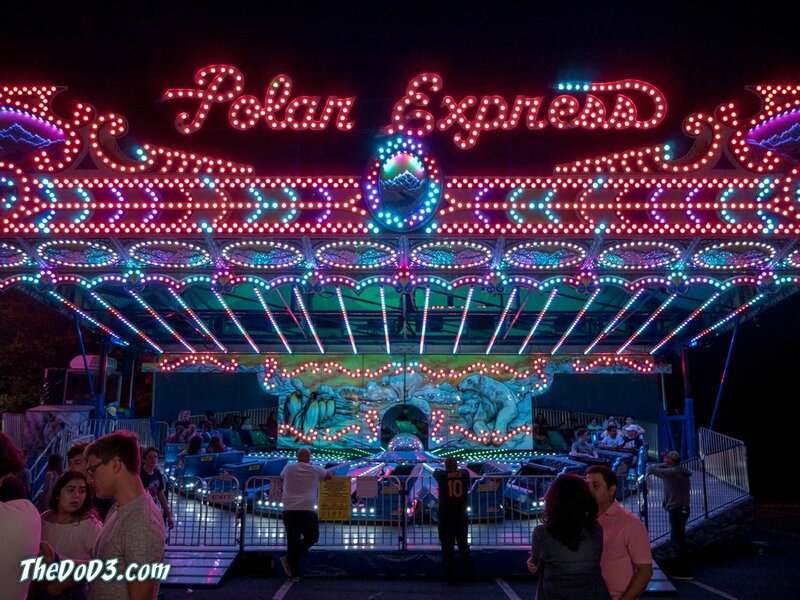 This second video is of Polar Express at 12th Street Amusements in Coney Island, NY. This is an original Reverchon model, or so I hear. It’s also unique in that it travels counterclockwise. 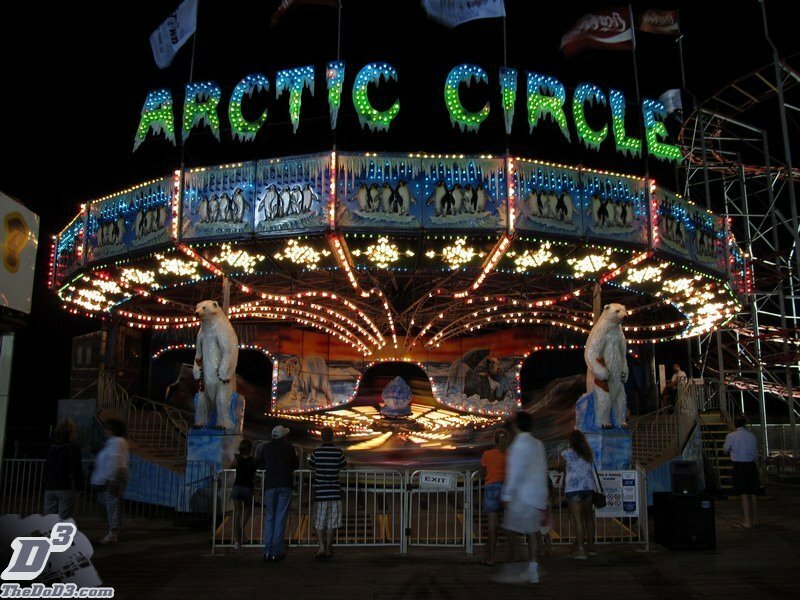 i love this ride, but what songs do they play on it in 2009 ? Well, from what I’ve seen, most Himalaya rides play either mid-90s techno, hip-hop, or old school rock. Whatever the person running it likes gets played I guess. It depends what type of music the ride operator likes if i was a ride operator of a wisdom version Himalaya i would play Rock music. 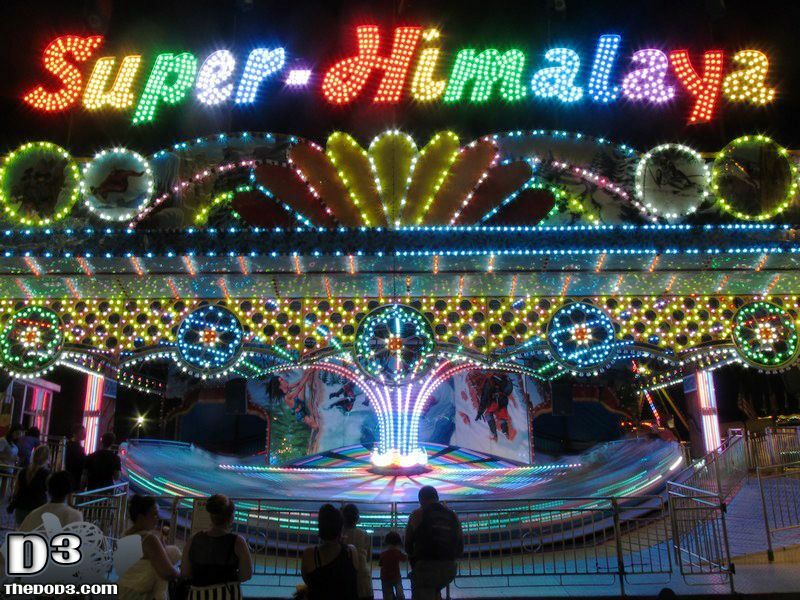 p/s back then we were the only super Himalaya in America and we had 24 cars with a power supply designed by nasa. I was one of the operators of the Morey’s Piers Musik Express during the 2009 season. She was my beloved baby! I’m the newest operator for the Morey’s Piers Musik Express, and I love her already! Everything is controlled manually, so she’s a very fun ride to operate. I love it when I get a ride filled with enthusiastic people, especially. I miss the old Judas Priest backdrop myself; the underwater orchestra thing is a bit too cutesy for me. We were just there for spring beach jam 2011–I would love to know some of the playlists–they were fun! The Musik Express at Six Flags Great Adventure was a much better ride in the 1980’s. 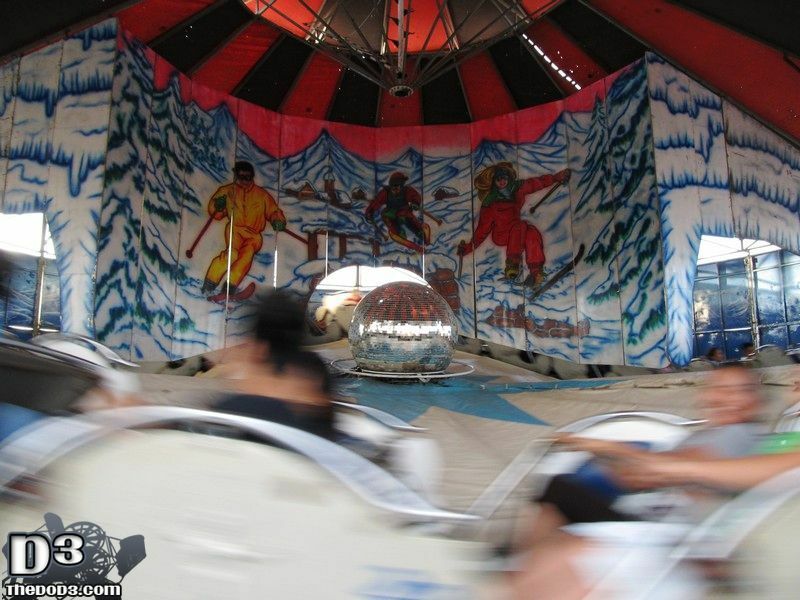 Back then, the ride had flashing lights, a cool backdrop creating the tunnel effect in the back half, and the operators blasted AC-DC and Led Zeppelin so loud you couldn’t hear yourself speak. The ride also went backwards back then. At some point after I stopped working there (late 80’s/early 90’s) they stopped running it backwards. By the time I was taking my own kids there, they had removed the backdrop and stopped playing music altogether, making it the rather boring version that you describe here. But I’ll always have great memories of that ride in its better days! 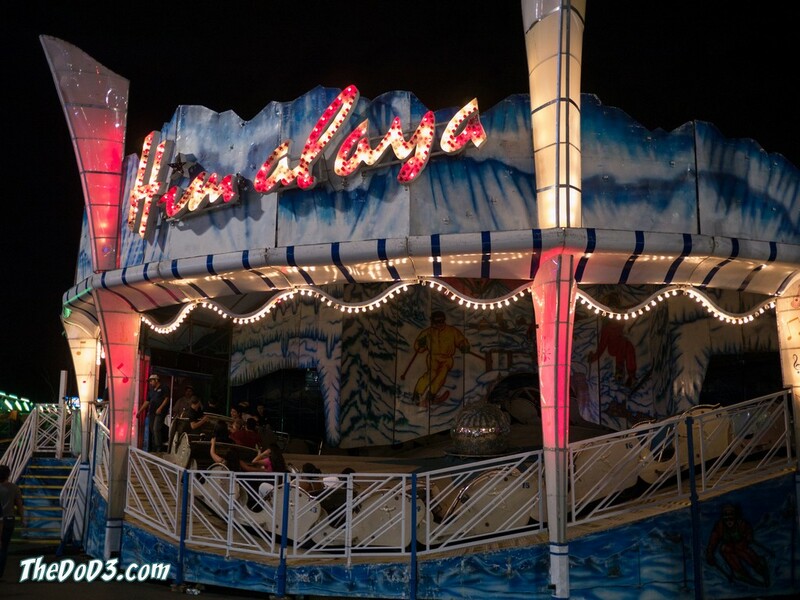 I want to buy an Himalaya ride, I like the Reverchon and Mack brand, please contact me for information about one of thst rides..
deseo informacion sobre el himalaya musik expres que sew tienen en venta. Cuales son sus condiciones de financiamiento ??? si es posible mandeme informacion exaustiva, y su catalogo de juegos en venta. Gracias soy propietario de juegos mecanicos en mexico ( Villagran, Guanajuato Mexico) Tels. 014111643082 fax. 014111650362 por favor contactenos. no ha mandado la informacion requerida, habra algun incidente por el fin de año? I am so glad there is a fan site for these rides……they are such a big part of so many folks summer years growing up!! 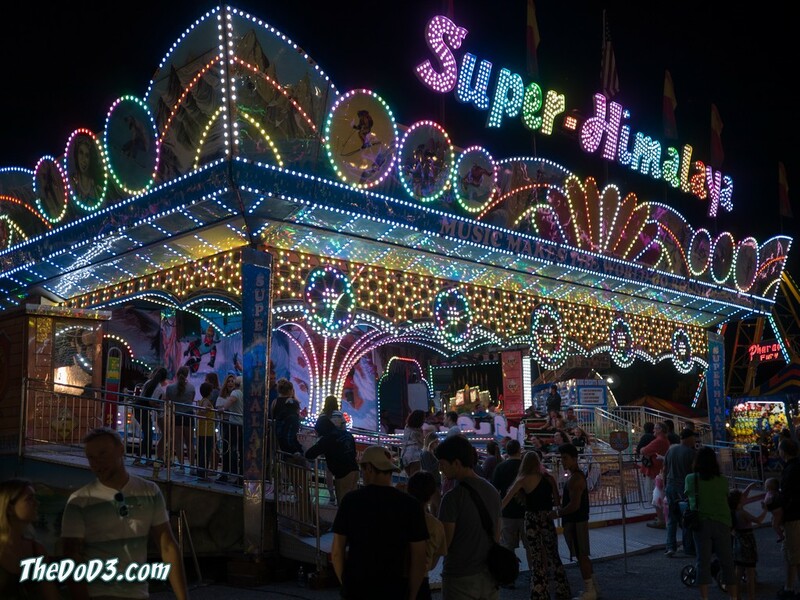 I for one, had to behave the entire summer to make one trip to Seaside Heights or Palasaides Amusement Park as a kid!…I envied the kids that went more than one time or visited several places so much! The former Magic Isles amusement park that closed in the late 80’s had one but I’m not sure which company made theirs. They had a DJ in the booth that would play modern rock songs of that era. One operator/DJ loved to play “Freeze Frame” by the J. Giles Band every other hour or so. Very cool ride for a young teen especially at night with the lights came on! Back in the 80 s there was a carnival at the Masonic homes called the Masonic picnic. It was put on by the Masonic lodge they had a himalaya ride there and the operator Would play one of elo’s songs about once an hour . Can’t remember the name of that song for nothing .does anyone know the songs name? Does any one remember a New Revechon Himalaya came to Coney Island in 1976, 1977 and 1978 on the corner of Stillwell ave. and the Bowery, behind Nathans Hot Dogs? Then it was replaced with a Revechon Matterhorn called the Disco Express 1979 and 1980. These rides at the time were the Newest Rides to come to Coney Island, Fantastic Lighting and a Spectacular Sound System, a nice Smooth Fast Exciting Ride. I operated that Disco Express after it moved to Wildwood, New Jersey in the summer’s of 1982 and 1983. It was on Mariners Landing Amusement Pier (Pier was owned by Morey’s) and the ride either belonged to or was being leased by Tom and Jerry Amusements. It was located next to the wild mouse-style roller coaster. I have not been able to track that ride down and am left to assume it was either rebranded or junked. Nor have I had success in tracking down Tom and Jerry Amusements. I heard they were based in Florida, but that’s all I know. I can’t even find pictures of the ride when searching a variety of keywords. If you know more about this ride, I would love to hear from you!